Signing a rental agreement with a new tenant signifies a new beginning and the hope for “perfect tenants”. Perfect tenants mean those who always pay their rent on time, those who take care of the rented property, and those who are not troublesome; essentially tenants who abide by all the provisions of the landlord-tenant agreement. Unfortunately, while this wish of a perfect tenant cuts across all nationalities and boundaries, this is not always the reality. If you have been a landlord for some time, you would know that no matter how pleasant and accommodating you are to all of your tenants there will always be a handful of problematic ones. Regardless of the time and care you spend to ensure that you will only be selecting the most reliable and responsible tenants, there will still be people who do not abide by the agreement. These troublesome tenants damage your property, refuse to pay rent, and even avoid you at all cost. When this happens continuously you should immediately consider going through the process of residential eviction. 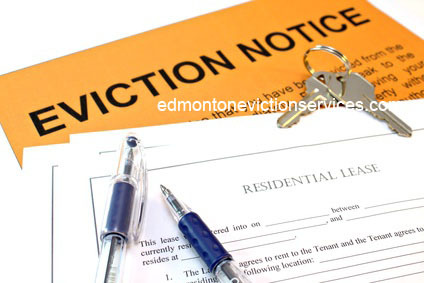 If your property is located in the areas of Red Deer, Edmonton, St. Albert, Sherwood Park, Fort Saskatchewan or any other areas in Alberta, Canada there are seasoned residential eviction services that you can hire to help. The eviction process demands your time, attention, energy, and concentration. As a landlord, you have other responsibilities that you cannot set aside while you are busy with the eviction process. For example if your tenant is in your Sherwood Park property, but you have other properties and businesses to manage at another location, you will be spread very thin. Hiring professionals to do the eviction work for you will make the entire ordeal bearable and easy for you and your family. Dealing with problematic tenants is already stressful enough but it would escalate further once you try serving the eviction notice yourself. Going through the legalities and trying to talk with troublesome tenants will cause you to lose sleep and be in constant state of anxiety. Wouldn’t transferring this burden to people who have experience a better option? The people who provide professional eviction services are knowledgeable of different laws and rules on eviction especially in your area. Through the years they have developed a certain expertise that you can never replicate overnight or even after weeks of reading and researching. There is a greater chance of successful eviction if you leave the dirty work to the experts. Meeting your tenants, serving eviction notices, and talking with them would always be risky especially if the people concerned are in poor mental health because of their problems and other concerns. It is always best to distance yourself from the process and leave the professionals to handle the work. Problematic tenants behave in different ways depending on where they are coming from emotionally and financially. Hiring a professional service removes you from these problems emotionally. Eviction services are able to handle the task due to their experience in dealing with all scenarios before. The reasons above are just some of the things that you will receive in exchange for a bit of money. At the end of the day, no amount of money or resources can truly replace going through the process without stress and worries. Need An Eviction Notice Form?